In a recent op-ed in the Daily News, Michelle Rhee explained that, because she's "pro-kid," teachers should give up any and all job protections, trust their fate to the hands of demagogues like Michael Bloomberg and Joel Klein, and hope for the best. Miss Rhee praised the visionary Randi Weingarten for giving away everything but the kitchen sink. 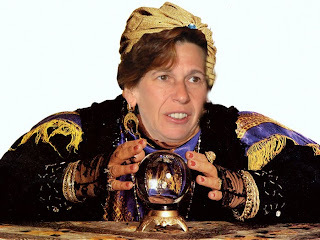 Ms. Weingarten responded with another op-ed, saying that DC had already given away a lot, and that her most recent deal did not actually give away all that stuff, since some of it had been given away earlier. Ms. Weingarten's final foray into NY negotiation reversed one of the many odious provisions of her giveaway-laden 05 contract--the two August punishment days. For this, Ms. Weingarten exchanged one day in June, .58 percent of a point of the raise Mayor Bloomberg is now denying us, and 3% of the salaries of all future hires for an additional seventeen years. I certainly hope we derive maximum enjoyment from those August days. Meanwhile, back here in NY, thousands of teachers are being excessed. Older teachers would have been placed in positions before 05, but will now be dumped into the Absent Teacher Reserve, from which their chances of being hired are abysmal. Rhee thinks, as does Klein, that they should be fired. The fact that yet another Weingarten-approved measure forces principals to consider their salaries when hiring them is neither here nor there. In Washington, the approach to education has been to flirt with fads and cure-alls. Instead of tackling systemic problems head-on, the city often has relied on a kind of magical thinking. To Ms. Weingarten, this somehow represents a difference from NYC. Ms. Weingarten, apparently, has forgotten mayoral control, which she repeatedly endorsed. She's also forgotten her merit pay system, the one that isn't merit pay, which failed to influence student achievement. She's also forgotten about the "lead teacher" position, the one that also didn't represent merit pay. And perhaps she's forgotten the bull's eye painted on the ATRs, none of whom would be in that position if not for her specific approval. Maybe no one has told her that the current UFT President just negotiated "value-added" to rate teachers--despite the fact that no research whatsoever supports its validity to do so. Ms. Weingarten labels DC “a school culture defined by education fads and a complete lack of trust,” and seems to feel because of that, it's somehow different from the school culture in NY. Is there anyone reading this who doesn't think her description applies to NYC as well? Ms. Weingarten is very good at noting what’s coming and embracing it early. That's how she and her army of sycophants enabled the miserable 05 contract. On the other hand, by that logic, death is coming too. You can't stop it. I can accept that. Still, I won't be stepping in front of a moving truck this morning. I'll leave such moves in the capable hands of Ms. Weingarten and her ilk. Thanks to David Bellel for the picture!